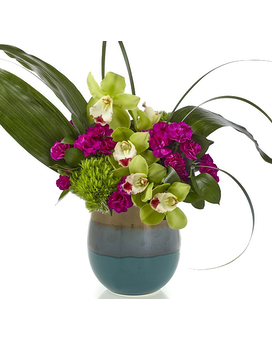 Celfi in Palm Springs CA - Palm Springs Florist, Inc. Send a memorable and unique design for that special person in your life. 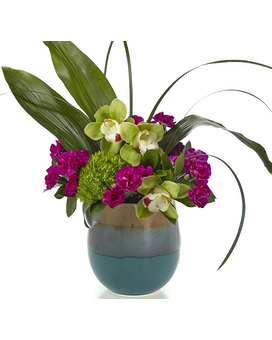 The Celfi pot makes for a fun display of colorful blossoms with brilliant color and a sweet sophistication to create the perfect impression! 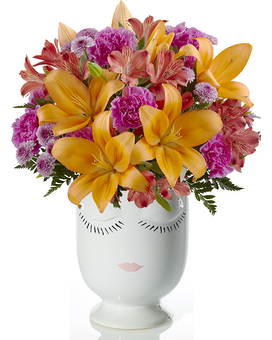 Asiatic Lilies make the eyes dance across the unique design of this flower bouquet, surrounded by the blushing colors of alstroemeria, button poms, carnations, and lush greens.